Kelly Dawson Author: L is for ... Laurel & Maggie with their tale of Lists, Love & Lust! L is for ... Laurel & Maggie with their tale of Lists, Love & Lust! I have more guests visiting me today for the #SpankA2Z - Laurel Jane and Maggie Ryan! They have a brand new book which sounds absolutely fantastic - I can't wait to read it! When Casey Reeves loses her husband to an unexpected heart attack, she gives herself a new mantra: To live life as if it were an amazing adventure, as every single day matters. Unfortunately, one of the things on her bucket list looks far better on paper, and when Casey finds herself up in a plane, strapped to a tall, handsome man, about to undertake her very first parachute jump, she realizes that she'd do just about anything to be able to back out. Paul Jackson has been a parachute instructor ever since he retired early, and has seen his fair share of terrified women, but when Casey hysterically promises to do anything he asks in return for being able to return to solid ground safely—even let him spank her—he's amused, and not a little intrigued. He's also more than willing to accept her bargain. Casey finds herself taking a leap of faith—in more ways than one. The two begin their journey together, spending some time on a luxurious yacht, in a tropical rainforest and even in a ranch in outback Australia, as they work their way through her list. What they discover is that life has a tendency not to follow carefully designed plans. With Paul beside her, Casey quickly learns that living every day to its fullest entails far more than she’d ever imagined. And by her side throughout the action, danger and laughter is a man who not only has no hesitation in reddening her bottom when she deserves it, but can send her soaring into ecstasy with a single look or a touch of his hand. Finding a new love to equal—or even exceed—her old one was not even on Casey's bucket list but now that she has, can they make it work? Is Paul really the man of her dreams? 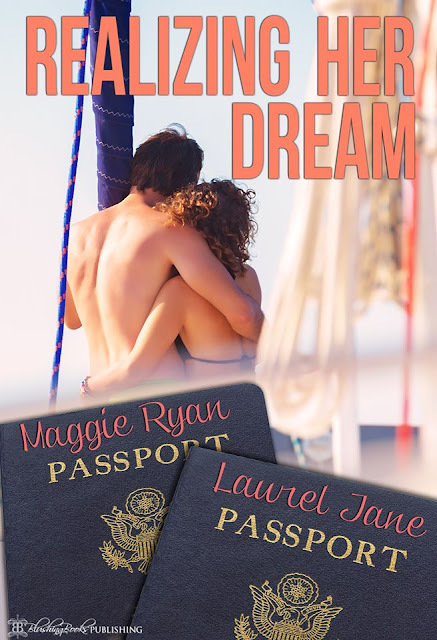 Best-selling author Maggie Ryan and newcomer Laurel Jane have put their heads and their pens together to come up with this, an exciting tale of romance, lust, love, spanking and adventure. "I'm very pleased to see you are still here," he said. Casey attempted to think of something witty to say, but every word stuck in her throat. The only thing she could do was nod. She thought about quipping that she had been born ready but for some reason, the man towering over her looked quite capable of making her prove it. "Um, to go celebrate? Is that what you mean?" "Believe me, Casey, you'll always understand exactly what I mean." He paused to hold out his hand and she took it automatically. "We'll have some dinner, and then for dessert—well, at least for my dessert anyway—I will give you the spanking you've been promised. This is your last chance to back out. If you agree, and by that I mean agree to both dinner and having your bottom blistered, I'll pick you up tonight. Now tell me, are you ready?" See what I mean? The book sounds fantastic! I've actually just started reading it. So far, I'm loving it! Grab your copy below.